After two year on-line campaign against Muslim athletes participating in international professional basketball competitions – the International Basketball Federation (FIBA) lifted its ban on headgears (hijabs, yarmulkes and turbans) on Sunday. The ruling has been hailed by Muslim basketball players and fans who felt such bans as sign of Islamophobia and demonization of Muslim women who refuse to scarify their religious tenets in order to compete in international sports events. “It’s important because more people will see that Muslim women can play, do play and are willing to play,” said Raabya Pasha, a member of the first all-Muslim women’s team, the Falcons, in Leicester, UK (watch video below). Asma Albadawi who started the Falcons team, says the lifting of hijab ban makes a difference to the sport. “We might not see it right now but, gradually in elite sports we’re going to see more Muslim girls in basketball playing with the hijab, in college basketball for example in America, and in places, where basketball is aired. It will make a huge impact because the more people that are seeing women look like them playing, the more impact it will have on the wider community,” she told Al-Jazeera. Iran is the first Muslim-majority country to establish all-female basketball team over two decades ago but due to ban on hijab, it refused to participate in FIBA events. 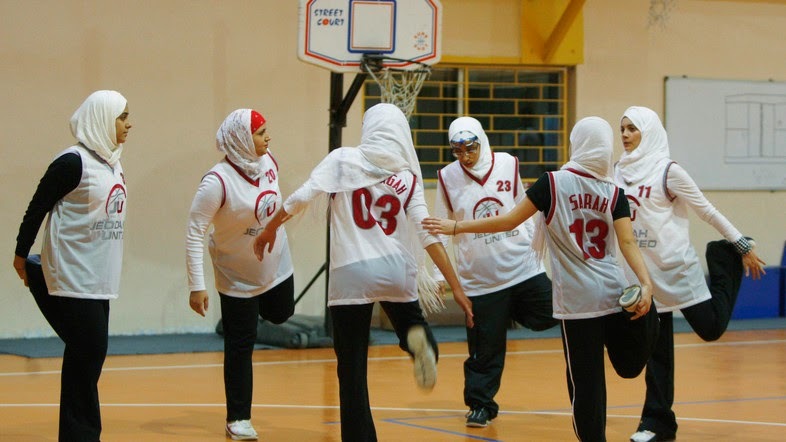 The other Muslim majority countries whose all-women basketball teams have competed in Asian and African sports events, are Turkey, Somalia and Qatar. Shireen Ahmed, a Toronto-based observant Muslim soccer player, writer and blogger has documented the stories of Muslim women in sports around the world (here). Islamic modesty rules are not against Muslim women taking part in gender segregated sports as a source of enjoyment, recreation and maintaining a healthy life-style. But local traditions in many countries are against women taking parts in sports just like in the Zionist entity. This entry was posted in World News and tagged sports. Bookmark the permalink.